The poor little mites are simply too young and innocent to realise that Australia’s suicidal renewable energy policy has already destroyed their prospects of gaining meaningful employment. They’d better hope that they can make careers out of vacuous virtue signalling, because, otherwise, it’s flipping burgers or frothing up skinny-soy lattes, for this lot. These are the words of Greta Thunberg, a 15-year-old Swedish student who last year, according to CNN, “shamed” negotiators at the UN climate summit in Katowice, Poland. Having failed to sway her Polish audience, she attended this year’s World Economic Forum in Davos, making the 65-hour round trip from Stockholm by train. There she spoke alongside Christiana Figueres, former executive secretary of what is now known as UN Climate Change, to a rapt audience of business leaders. When it comes to protesting, Greta’s no stranger. Before last year’s Swedish elections, she protested outside Stockholm’s parliament, during school hours, every day for three weeks. She also led a march of thousands of Belgian students who, for eight consecutive weeks, skipped school to express their anger over global warming. Last month, the radical New York Democratic congresswoman Alexandria Ocasio-Cortez joined this juvenile groupthink by introducing the Green New Deal, a non-binding resolution that, among many other extreme steps, would eliminate almost all fossil fuels in the US in just 10 years. It would ­require every building in the US — including every home — to be retrofitted for energy efficiency. Students rejoiced. Veteran Democratic senator Dianne Feinstein was bailed up in her office by teenagers demanding she support the Green New Deal. She objected, saying “there’s no way to pay for it”. “But we’re the people who voted for you, you’re supposed to listen to us,” one student exclaimed. “You didn’t vote for me,” Feinstein told the 16-year-old. Now a British group called Youth Strike 4 Climate is attracting protesting students from more than 60 cities and towns across Britain. 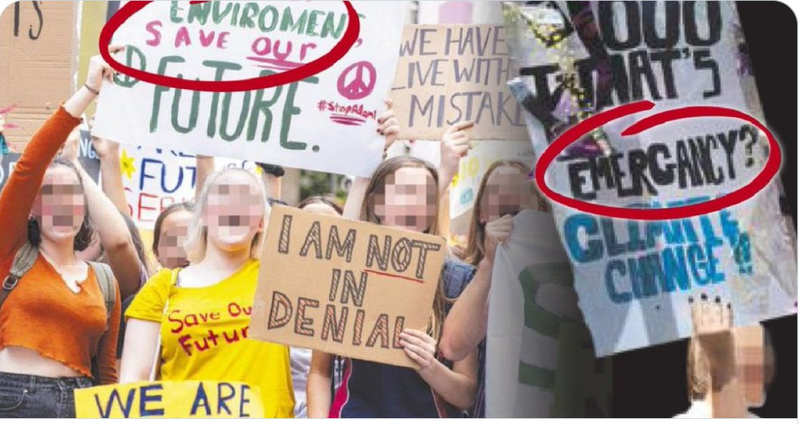 It has spawned an Australian clone, School Strike 4 Climate Australia. 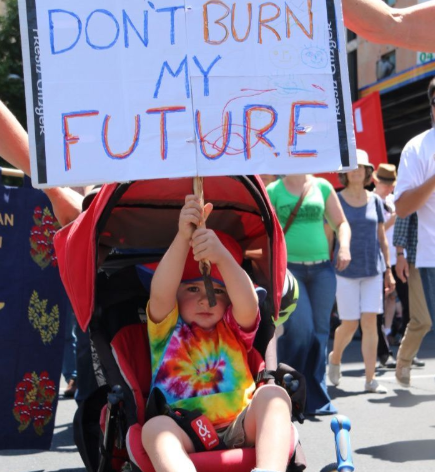 More than 500 academics, consumed by the approaching ­catastrophe, have now signed an open letter of support, warning you don’t need to be a professor to understand that by continuing to burn climate-cooking coal we are ruining any chance today’s children have for a safe future. Children have become the latest weapon in the arsenal of anti-Western activists, designed to keep pressure on wayward politicians in advanced economies whose enthusiasm for Paris emissions reduction commitments is visibly waning. Consistent with Vladimir Lenin’s communist teachings, these global-warming zealots need “that generation of young people who begin to reach political maturity in the midst of a disciplined and desperate struggle against the bourgeoisie”. Their goal is not to save the world from ecological calamity but, as Figueres confirms, to ­destroy capitalism. Students are too idealistic to see they are being manipulated. They have been so brainwashed that they accept uncritically the world’s most urgent issue is “lack of action on climate change”. They even reject as being praiseworthy Australia’s per capita ­renewables deployment rate, which, an Australian National University study reports, is four to five times faster than in the EU, the US, Japan and China. It follows then that they have little concern for the damaging practical consequences of an ever increasing dependence on renewable energy, which has pushed up real Australian electricity prices by 76 per cent in a decade. Nor compassion for those poor households with big families. A KPMG study found “there is barely $3 a week difference between per-capita spending in the lowest and highest quintile households on energy”. And no compassion for the 109,000 Australian households that, in the past ­financial year, had their electricity disconnected because they couldn’t afford it. Another 65,000 are on hardship programs. Perhaps, in their youthful zeal, students believe the ends justify the means? So, come winter when energy-poor elderly die from the cold, they will be rationalised as unfortunate collateral damage? If the poorest in society receive such little consideration from ­students and teachers, what hope business? The same rising costs of energy, compounded by reduced access to base load power, are crippling them. Tomorrow is Global Day of Planet Action in which children from 50 countries will participate. And so they do. However, when finally these young idealists confront reality, it won’t be global temperatures they will have influenced, only the political climate. But that’s for another day. For the moment, thanks to their left-wing education, they and the ­majority of their millennial brothers and sisters have unshakeable faith that socialist leaders will undertake the ­required action on climate change while simultaneously managing the transition away from capitalism. Or, as Figueres puts it, impose “radical collaboration among businesses, non-governmental organisations, universities, local and state governments, and communities”. Dianne Feinstein is right. Teenagers are not able to vote for her. But in just a few years they will be able to vote her out as they follow their utopian dreams down the road to serfdom. This little fella will soon learn his economic future is already toast. All those complicit in this mass truancy should be held to account, though the rule breakers are also probably the rule makers so we won’t see any consequences for this blatant disregard for the Education departments’ own policies. The NZ massacre overshadowed all this last Friday. The UN needs to be held to account for using energy production to reduce the emissions. In doing so they did nothing to investigate adverse effects of such a policy prior to mandating it. Nor did any Government first investigate what would happen before signing up to it. Teachers, media, parents and pressure groups have all taken on a role to educate children into this mess without considering what the ramifications will be to the children they are indoctrinating. Since this mire of garbage took hold the use of battery operated ‘essential’ products has continued unabated, the promotion of battery driven motor vehicles is gaining support, the electrification of public transport is speeding up with each of these things requiring electricity to function. We are using more and more energy in our everyday lives than we have ever done – but have children been educated fully as to where all that energy will come from. Have they been informed of the dangers some of the energy production methods being promoted create for human health, the environment and the continuation of our diversity of fauna, flora and avian species? Do they know that yesterday across the whole of the Eastern Grid there was next to nothing in the way of Wind energy until the middle of the afternoon. Do they know that the sun was also not producing in many areas due to be under cloud, or do they know that when a homes solar water heater cannot reach more than a lukewarm temperature due to cloud it needs a boost from another source of electrical energy. Even the ‘Big’ batteries were unable to replenish themselves during this period unless they took from the grid which was functioning mainly from the use of Coal with some help from Gas and Hydro but very very little from wind or solar. Without Coal yesterday the Eastern Grid would have gone off line. I doubt teachers stood before their classes yesterday afternoon or today and explained this to the ‘sponge’ brains of their ‘captured’ audiences. I wonder how many of those kids would have shown up if the march were held on Saturday instead? And if they’re so concerned about climate change, why exclude nuclear power from the narrative? That would actually work and their reason for ranting would disappear. Ya gotta love it and they say the human race are the smartest race of Animals on the planet. Has anyone ever done a cost benefit analysis on education and what effect it has on children’s brains when it’s main teaching practitioners are left wing Zealots.